Summit Mount Hood! This snowy peak towers above Oregon, inspiring climbers and non-climbers alike. It’s glaciated flanks hint at Hood’s notoriously stormy conditions. This makes it both difficult and beautiful to ascend. 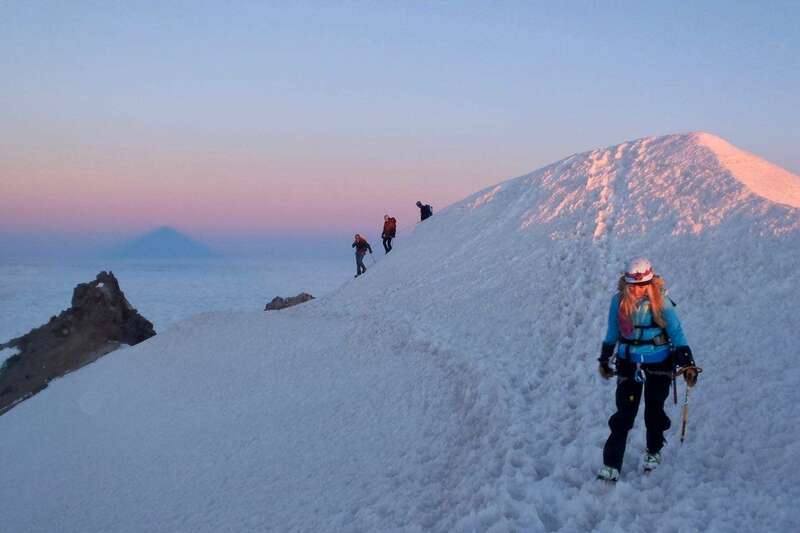 Climbers come from all over the world to stand on Mount Hood summit. Our goal, is to help you get there, with a little education, training, and encouragement along the way. You will meet your guide at the Timberline Lodge, and begin by checking gear and fitting crampons. Outside, on our practice snow slopes we’ll learn footwork, crampon and ice axe technique, rope-systems, and self-arrest. Your climb begins in the middle of the night when you meet your guide and snowcat for transportation to the wilderness line. Our Hood summit ascent is usually between four and five hours, and we’re often back at the Timberline Lodge before noon. A climb to the Mt. 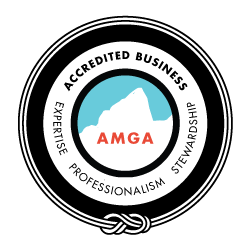 Hood summit by the standard route will include roped climbing in technical terrain on steep slopes of snow and ice. Most people are surprised by how steep and exposed the climbing is. We hope to reach the reward of Oregon’s highest and most iconic peak – the Mount Hood summit – it’s all worth it when you see the view! The Mt. Hood Summit Program is our most popular and successful climbing program. Mount Baker’s Coleman-Deming glacier is a great place to add fundamental glacier skills to your climbing toolbox. Alpine rock climbing like the North Ridge of Mount Washington is a great stepping-stone toward North Cascades summits, because they often combine snow and rock climbing. No prior experience is necessary – Mt Hood is an excellent place to learn fundamental mountaineering skills. Climbers should arrive with excellent physical fitness.